Attorney Christopher B. Gierhart Joins Weld Riley, S.C. The law firm of Weld Riley, S.C. is pleased to announce Attorney Christopher B. Gierhart has joined the firm. 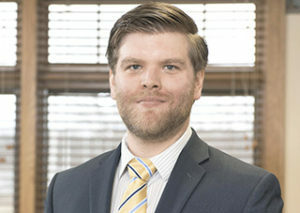 Prior to joining the firm, Gierhart represented numerous clients in various civil actions, including collection (debtor and creditor), eviction, personal injury, contract, insurance coverage disputes, adverse possession, and partition. Gierhart has also represented local municipalities in a variety of legal matters, including representation at meetings, advising on compliance issues, and prosecution of citations. He has assisted clients on personal and commercial real estate transactions, including preparing and reviewing purchase agreements, lease agreements, and closing documents. Further, Gierhart has provided clients with advice on the process of forming, structuring and operating entities for their businesses. In 2012, Christopher Gierhart earned his Juris Doctorate from the University of Wisconsin-Madison. He has been admitted to the Wisconsin Bar Association, U.S. Tax Court and the U.S. District Court, Western District of Wisconsin. He is also a current member of the Tri-County Bar Association and was a Director for the Arcadia Chamber of Commerce.